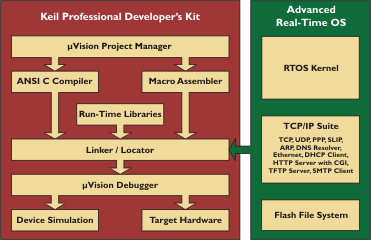 Third-Party Utilities extend the functions and capabilities of µVision. Keil PK166 is a complete software development environment for XC16x, C16x, and ST10 microcontrollers. Like all Keil tools, it is easy to learn and use. Keil ARTX-ARM enables networking, communication, and real-time software. The Getting Started user’s guide describes the installation of MDK, all product components, and the complete workflow from starting a project to debugging on hardware. The Japanese Getting Started user’s guide describes the installation of MDK, all product components, and the complete workflow from starting a project to debugging on hardware. The MDK Version 5 product brochure describes the features and benefits of the ARM Microcontroller Development Kit Version 5, the Middleware and the available debug adapters. The guide book Getting Started with DS-MDK describes the installation of DS-MDK and the complete workflow from starting microcontroller and Linux projects to debugging them on hardware. The MDK Version 5 product data sheet gives a quick overview and explains the available MDK editions with their order codes. The ULINK product data sheet gives a quick overview over the available ULINK debug adapters and lists their order codes. The Cx51 product brochure describes the features and benefits of the C51 Development Tools and the C251 Development Tools. The C166 product brochure describes the features of the C166 Development Tools for XC166, XE166, and XC2000 devices.